Agde is a small town in the Languedoc-Roussillon region on the south coast of France, just over 60km from Montpellier. The river Hérault runs through this charming Mediterranean port, which has both stretches of beautiful sandy beaches and old winding streets. 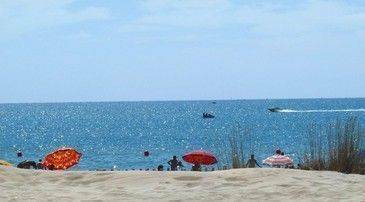 The nearby naturist beach of Cap D'Agde is extremely popular in the summer months but the town of Agde is a quieter neighbour - a place to get away from the crowds and spend calm days in a traditional French town setting. The town is set on a volcano and the lava rock is what many of the local buildings are made of, giving them a dark, distinctive look. The Canal du Midi passes through Agde and gives the town a peaceful feel, where you can take boat trips that take you through neighbouring Séte before leading you to the Mediterranean. Madame Vacances Les Pescalunes Cottages are situated in a pine forest right between the Cap d'Agde and the town of Agde, with views out over the Mediterranean. From the Residence you are just a short walk from the beaches down a hill with walking and cycle paths. 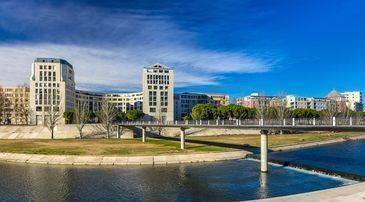 The town is only 1km away and the neighbouring towns of Bériers and Séte are just 25km away and worth a visit to explore the Languedoc region. Being one of the oldest towns in France, founded in the the 5th century, Agde is full of fascinating history to explore. The town was an important maritime port up until the 18th century, being situated at the mouth of the river Hérault, where it flows into the Mediterranean. The landscape is formed by the black volcanic rock from the Mont Saint-Loup volcano that erupted 750,000 years ago and created the stunning coastline in this region. The extinct volcano is now an area of natural beauty, with many walks and trails surrounding it. Within Agde itself, pleasant days can be spent walking through the maze of streets in the ancient town. The Saint Etienne Cathedral is a stunning and original point of interest, having been built completely from the black volcanic rock in the 12th Century. The church was built as a fortress and resembles a castle more than a church, with walls metres thick and crenellations at a height of 35 metres. The Place de la Grande Conque is a stunning beach made up of the black sand and rock from the volcano while the Nature Reserves de Bagnas is a serene grassy area perfect for walking and picnicking. The town also boasts a spectacular villa le Chateau Laurens designed by Emmanuel Laurens, a 19th Century doctor and extended from his family house, making it a feature of the area. The house contains gorgeous examples of Art Nouveau architecture and is lit up at night. The Bateaux du Soleil river cruises leave from the port at Agdes where you can eat a meal while watching the sun set over the Med. As well as scuba diving or snorkelling to see the fantastic underwater beauty, boat trips for whale and dolphin watching are also available. For museums, the Musee Ephebe is a small but fascinating history of artefacts discovered off the nearby coast from the 19th century to the present day. Or the Noilly-Prat factory, 5km from the town, offers a history of the Vermouth production that the area is known for. 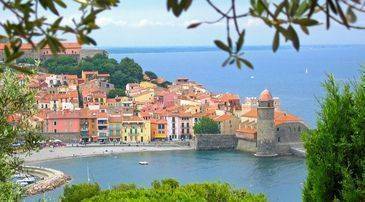 Agde is a small town, so for action and adventure you want to head to the Cap d'Agde. Famous for its naturist beaches, the Cap also features hosts of sports and activities perfect for holidays. 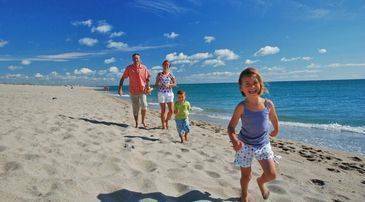 Any kind of water sport you can think of can be undertaken here and there are several excellent water parks to visit with the family. Captain Jako is a water playground for the under 7s, while Aquapark and Aqualand are water parks with inflatables, rides and slides for the whole family. Luna Park fairground makes a fun night out, with rides and lights to entertain. For small children, the Ile de Loisirs, near Aqualand offers pony trekking in delightful surroundings, making for a peaceful day out for families. Fort Brescou is known as the Alcatraz of France, an ex-prison over 400 years old and built on the volcanic island, it is now a visitor attraction and can be reached by ferry from Agde. For night entertainment and to let your hair down, Cap d'Agde is brimming with bars and clubs that spill out onto the beaches and go on all night. The Agde region is well equipped for the tourists that visit every summer, so if relaxation is what you're looking for there are lots of spas and health centres near the town or in Cap d'Agde. Autres Regards and Kheops Sauna are both in Agde itself and offer massage, spa, sauna and other health facilities. The Archipel la Cité is a 10-minute drive from Agde and comes well recommended. You are also welcome to make the most of Madame Vacances' facilities. The resort offers a heated swimming pool, pétanque grounds and ping pong. Or you can cook your own dinner and eat on your private terrace in the beautiful surroundings. 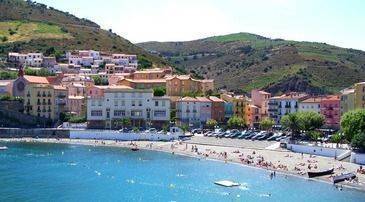 Agde is best known for its beaches and at the Madame Vacances Résidence you are ideally located to reach them. The nearest beach is under 10 minutes-drive away and is part of the the long 14km stretch of sandy beaches known for being the best in France. The Cap d'Agde is covered in gorgeous stretches of beaches but is best known for its naturist beach which has some of the nicest, cleanest sandiest beaches you could wish for. There is a Eu5 charge for this beach but you will be guaranteed a beautiful experience. If a smaller, less overt beach is what you're after, head to the Plage de la Conque or La Plagette, isolated coves, Plage de la Conque formed from the black volcanic rock and covered in black sand. The Richelieu and Rochelongue beaches are quiet with parking areas and back onto footpaths, with great views to Séte and the Pyrenees. If you are with small children, then le mole is a good bet as the water is shallow and safe for paddling. There are also showers and toilets on the beach as well as easy parking. La Roquille is a shelly, less sandy beach but here you can rent sun beds and there are snack shops and showers available. Near the aquarium and off a pleasant promenade you will find La Plagette, a small sandy beach with restaurants close by and an underwater path for snorkelling. For a more remote beach head further south into the cap d'Agde for St Vincent beach which is quiet and remote, or there's La Tamarissiere, which is bordered by pine forests. You are spoilt for choices of restaurants and cafés in Agde with plenty of traditional cuisine, freshly caught seafood and fish as well as international dishes for all the family. If you head to the Cap d'Agde, there are beach bars that serve snacks or evening meals with beach views. To be authentic, you can try one of the many seafood shacks in Cap d'Agde to get a handful of fresh oysters caught locally or a twist of prawns to be eaten on the beach. La Poissonnerie du Cap comes highly recommended, with excellent fresh seafood in a beautiful setting. There are so many places to eat here it will be a big part of your holiday, as eating and living well is what Agde is all about. There are lots of tapas restaurants, among which le Bistrologue is rated one of the best. For the times that you'd like to relax and stay close to home, another option is to make use of the on-site kitchen facilities; all houses, villas and apartments are equipped with a refrigerator, microwave, oven, hob and a washing machine. You will also find local supermarkets and amenities within a few kilometres of the resort. There are also several local markets for all kind of fresh food for you to try out local specialities as well.